Okay, so just the other day I made healthy Summer Shrimp Tacos. And I had a good amount of shrimp left over, so I decided to get creative and make a healthy shrimp salad. Well, I’m not trying to brag, but it was pretty freaking awesome. So I thought I’d post my recipe for Savory Shrimp Salad. First thing first: make the shrimp sauce if you haven’t already. Mix Greek yogurt with lime juice and chopped cilantro and set aside to chill in the fridge. Next cook the shrimp. Mix defrosted shrimp with garlic, ground cumin, cayenne pepper, and half the honey and sauté with vegetable oil for about 5 minutes. Make sure to check it! And when it’s pink, remove from heat and cover to keep warm. Now assemble the salad mix: your lettuce/spinach/kale/greens, add the coleslaw and salsa (you can vary the amounts depending on how much you want or what size salad you want!). Add your yogurt/lime/cilantro dressing and shrimp and mix. Finally, drizzle your honey on top and you’re set! 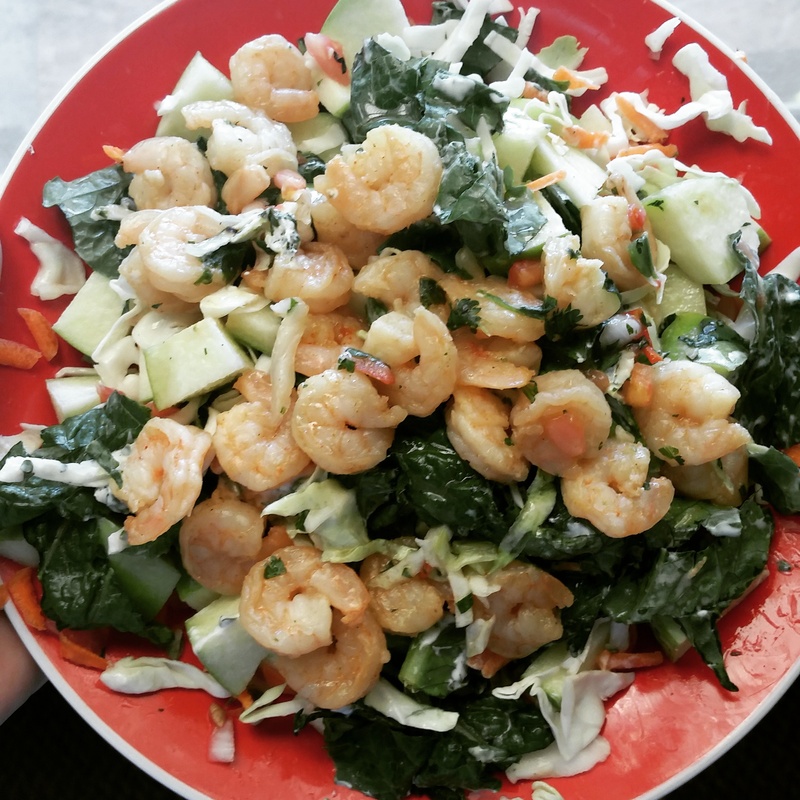 A wonderful-tasting, healthy Savory Shrimp Salad!